Are you interested in learning about the sunflower tattoo? Perhaps you're considering getting one of the most well-known and brightest flowers tattooed on your body and would like some ideas for designs? Perhaps you would just like to learn the meaning behind the design and find out what it stands for? Keep reading to learn more about the sunflower and get a few ideas for designing your own. Many people are aware of what a sunflower looks like. It is, along with roses and daises, one of the most well-known flowers. The flower is known for growing primarily in warm, sunny areas. Additionally, the flowers strong, yellow color and it's long, durable stem evokes feelings of extreme joy. The flower is reminiscent to some of pure sunshine and happiness. As a result, sunflowers are often thought to be one of the most jovial flowers. 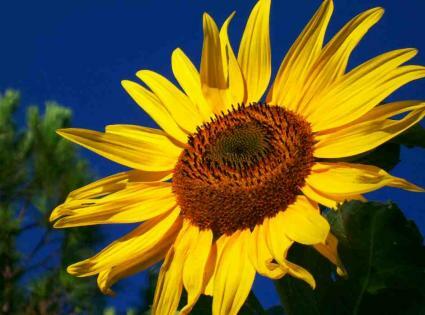 The sunflower began with the ancient Incas who worshipped the sunflower as a symbol of the sun God. Early signs of the sunflower show its roots in Mexico. The sunflower was brought to Europe in the 16th century and began to spread throughout the world from that point onward. In planting, the sunflower requires a certain amount of space and most parts of the flower are used for different purposes. For example, sunflower seeds are a popular food and sunflower oil (extracted from the seeds) is popular in the commercial cooking world. A fun fact about the sunflower is that it can be used to remove toxic ingredients from the soil. Planting sunflowers in soil that also has lead and uranium present can often result in the sunflower pulling these poisons from the soil. Some optimists speculate that this is because not even poison can stop the sunshine quality of the flower. No matter what the reason you are interested in a sunflower tattoo, the actual design of your tattoo can be quite versatile. The sunflower is known for it's large circular center. 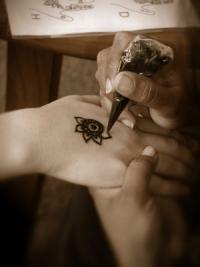 Many people choose to change their tattoo up by changing the center into something else. For example, you can change the center to a celtic pattern, to a word phrase, or to another pattern of your choice. The tattoo would fit nicely on the shoulder or hip. Other people choose to change the petals of their singular sunflower. You can change each petal to a wing, a wave or a flame. Many people choose to add other design elements around their sunflower to customize it to their personality. A popular choose is adding butterflies. Another popular idea for a sunflower tattoo involves a grouping of sunflowers put together. The design especially makes sense as the flowers are usually grown in large fields. Instead of just getting sunflowers, consider getting a bouquet or mixture of flowers together. You can add, for example, a few cherry blossoms or roses to complement your pattern. You can find elaborate ways to connect your sunflowers, perhaps by using flower vines or music notes to connect each flower. The sunflower can fit nicely into a much larger piece of art due to their simplicity. You can get a large back piece of a field of flowers or incorporate other types of art (such as dolphin art) into your sunflower. One of the best parts of any tattoo is making the design your own. If you are interested in getting a sunflower somewhere on your body, think long and hard about your decision. In the end, you will end up with a piece that will be as proud as your sunflower!